A broad-based movement against official corruption is rocking Guatemala to its core. A massive tax fraud scheme exposed in Guatemala this April might once have been viewed as business as usual in a country that has struggled with corruption at the highest levels for decades. A protest organized via social media quickly erupted, sparking an ongoing wave of demonstrations that’s drawn the participation of tens of thousands. For the first time in Guatemala's recent history, a broad cross section of society -- including politicians, students from both private and public universities, the country's powerful business lobby, indigenous peoples, and members of a historically passive middle class -- joined together in a unified call for the removal of corrupt officials. Vice President Roxana Baldetti was the first to step down, handing in her resignation on May 8. Although she wasn’t implicated in the initial corruption investigation, she was plunged into controversy when her private secretary, Juan Carlos Monzón Rojas, was identified as the leader of the fraud ring. Shortly after her resignation, Baldetti was also placed under investigation. As investigations continue, high-level officials in a number of major executive branch offices have resigned or been fired. President Otto Pérez Molina has dismissed or asked for resignations from his chief of intelligence, the ministers of the environment and of energy and mines, and his interior minister, among others. Many of the ousted officials are members of Pérez Molina's inner circle and are under investigation for various acts of alleged corruption. These ministry shake-ups have not been enough to quell calls for the president's resignation, and weekly protests continue to fill Guatemala City's central plaza. With the curtain pulled back to expose what many have called one of the most corrupt administrations in Guatemala's history, the country is facing its biggest political crisis in years -- and just a few months before September's general elections. On June 10, Guatemala's Supreme Court accepted a petition to allow congress to decide whether to revoke President Pérez Molina's immunity from prosecution for possible involvement in acts of corruption. Whatever the president's fate, sustained public outrage has united a diverse Guatemalan public and represents an incredible opportunity for the country to undergo historic and positive changes. The initial scandal that sparked public disapproval involves a criminal network that’s been called La Línea, or “The Line,” in reference to a certain cell phone number importers called to negotiate the amount they paid in customs taxes. Thanks to the network, businesses could receive an illegal “discount” on the required fees when their property cleared customs. Approximately 50 percent of the balance was then paid to the state. The rest went to a network of defrauders that included corrupt officials and their collaborators. On April 16, authorities arrested 22 people -- including the current and former heads of Guatemala's tax collection agency. The eight-month investigation was a joint effort between Guatemala's Public Prosecutor's Office and the International Commission against Impunity in Guatemala (CICIG), a UN-backed institution charged with investigating and helping disband clandestine and parallel power structures linked to the state. Prosecutors estimate that Guatemala lost at least $120 million in tax revenue in the eight-month period to the scam. And as the investigation continues to unfold, it’s revealed an inter-connected web of judicial corruption that’s been nicknamed the “Law Firm of Impunity,” resulting in investigations into judges and justices on Guatemala´s Supreme Court. “The parallel power structure that has been revealed through the CICIG's investigations is derived precisely from the existence of a larger 'pact of impunity,'” said Iduvina Hernández, a political analyst, columnist, and the executive director of the Association for the Study and Promotion of Security in Democracy. This “pact of impunity” is referenced frequently in Guatemala to signal the ways that members of powerful sectors work together to protect their resources, influence, and immunity to prosecution. Often this occurs at the expense of the poor. In the case of La Línea, for example, individuals at the top of the chain allegedly raked in millions of dollars per year while state institutions lacked important resources for medicine, education, and basic security. It was this dramatic contrast that inspired many to protest. 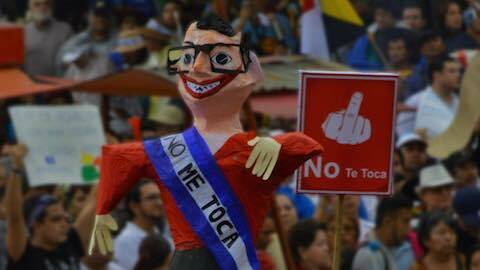 A massive demonstration on May 16 -- some 60,000 strong -- expressed anger at the country's deep inequalities, as protesters held signs illustrating what income lost to La Línea could have provided in public services. Just a week later, a second investigation by CICIG and the Public Prosecutor's Office revealed another corruption scandal within Guatemala's Social Security Institute, or IGSS. The institute had awarded a kidney dialysis contract to the company Droguería Pisa in exchange for kickbacks to government officials, including IGSS employees and the head of the Guatemalan Central Bank. Pisa had no expertise providing the treatment, and 13 have people have since died. Seventeen public officials and other collaborators have been arrested, but most notable has been the arrest of the president of the board of the IGSS, Juan de Dios Rodríguez -- a powerful former military man who once served as Pérez Molina’s private secretary. As the situation in Guatemala changes daily, many scenarios could play out. The intense demand for Pérez Molina to step down -- and for elections to be postponed until serious reforms are passed -- reflects the almost universal recognition that the system is broken. Pérez Molina has stated that he won't resign, and Guatemala's powerful business lobby -- along with the U.S. government -- seems willing to back him in order to preserve some stability. And while the September elections are still likely to move forward as planned, the pool of candidates have left voters feeling deflated, and the call for “voto nulo” -- or a null vote -- is growing in urban areas. Many analysts caution that swapping one politician for another will not address deep concerns over systemic corruption. Another possible, yet unlikely, scenario exists in which Guatemala could convoke a “National Constituent Assembly” -- a group of citizens named to initiate a process to draft a new constitution. These proposals, however, have also prompted fears that a break in the constitutional order could create a power vacuum, doing Guatemala more harm than good. Meanwhile, corruption is only one piece of the puzzle. Many civil society and human rights groups have taken the opportunity to draw links between current scandals and other ongoing concerns -- including a record level of attacks against human rights defenders, a level of aggression against the press not witnessed in a decade, and the blatant manipulation of the selection of an attorney general and judges in 2014. Will the U.S. Continue “Business as Usual”? As Guatemalans demand widespread reform, the United States also has an important opportunity to reevaluate the role it can play in supporting meaningful change. The U.S. government has been a consistent supporter of Pérez Molina, himself a very controversial figure. He’s the subject of an open investigation into his alleged involvement in the torture and assassination of guerilla leader Everardo Bámaca in the early 1990s, and many have raised questions about his possible participation in acts of genocide against the indigenous Ixil population in the 1980s. During his 3.5 years in office, the U.S. has also worked closely with his administration to “strengthen” institutions, improve prisons, train security forces, and bulk up border security. At the same time, the prisons have been through numerous scandals, and the security forces -- both military and police -- have been responsible for a number of extrajudicial executions and widespread corruption. Along with the urgent need to reform laws related to Guatemala's political parties and elections, judicial strengthening and independence is probably the single most important next step to address the country's myriad of problems. And some U.S. officials have stressed a commitment to supporting justice. Yet overall, U.S. policy has been largely focused on “security” and, most recently, on preventing migration from the region. The U.S. Congress is currently debating a $1 billion request from President Barack Obama for investment in Central America following a spike in the undocumented migration of unaccompanied minors last summer. The proposed funding package closely mirrors the objectives of a parallel plan, called the “Alliance for Prosperity for the Northern Triangle,” which was created by the region's three presidents and the Inter-American Development Bank. Civil society organizations from throughout the hemisphere have expressed grave concerns about the plan, including a lack of civil society participation in its formation and worries that it could actually exacerbate poverty and violence. Organizations in both the U.S. and Central America are watching closely to see how the U.S. will engage in Guatemala given the government's loss of legitimacy. Nevertheless, in a country that hasn’t seen such diverse and massive protests in many years, there is hope in Guatemala that sustained public outcry could create a space for long-term change. The United States, too, should make sure that its own policies -- which have in the past exacerbated repression and violence in the region -- provide real support for efforts to dismantle corruption and strengthen justice. Lindsay Bigda is a communications associate for the Guatemala Human Rights Commission. Article: Courtesy: Foreign Policy in Focus. "An Unprecedented Uprising Against Impunity in Guatemala"